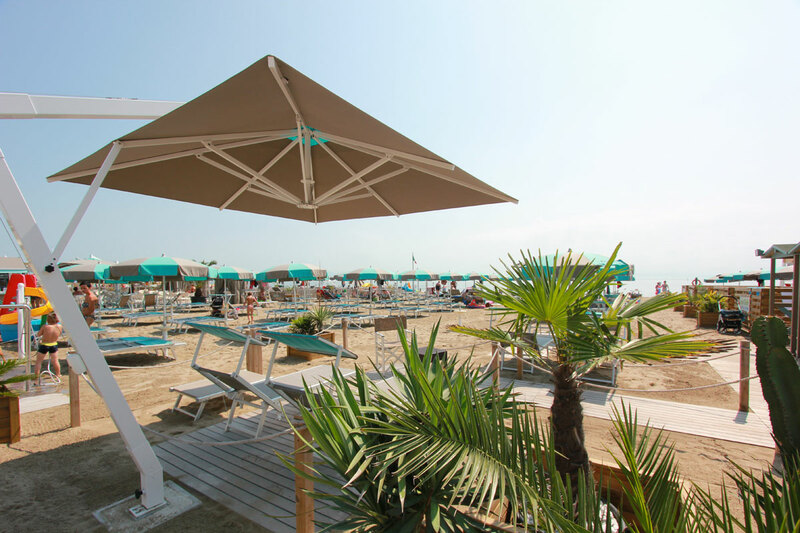 n° 105 Classic places equipped with beach umbrella, 2 beach beds with canopy and (optional) dog cot. 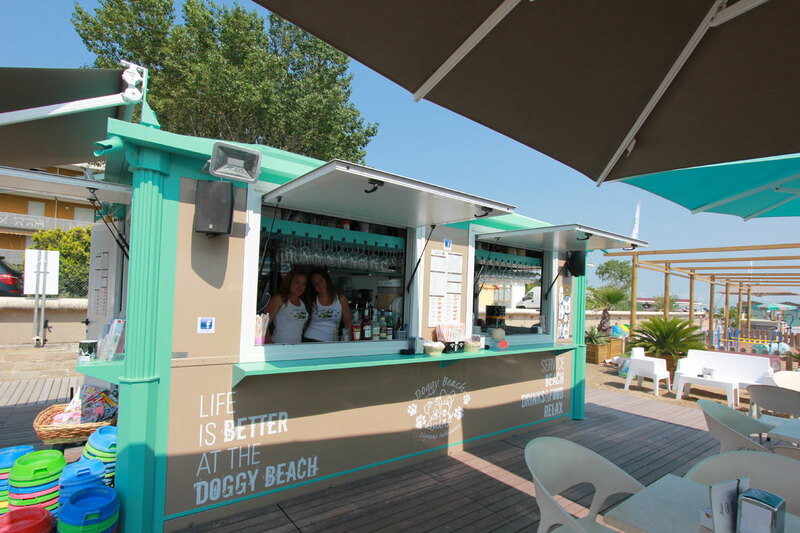 n° 20 Dog-Vip places equipped with beach umbrella, 2 beach beds with canopy and (optional) dog cot in a private fenced area measuring 4,00m x 3,20m and height 0,90m where your dog will be able to stay without leash. 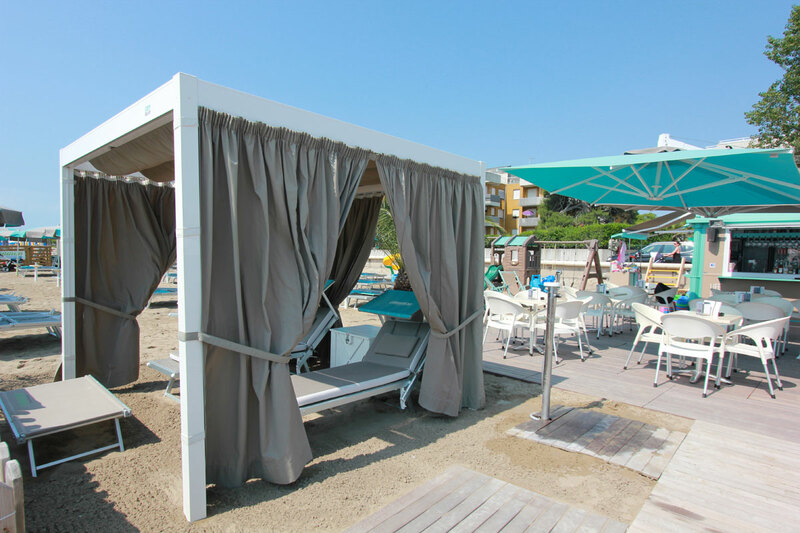 n° 10 Dog-De Luxe places, equipped with beach umbrella, 2 beach beds with canopy and (optional) dog cot in a private fenced area measuring 4,00m x 3,20m and height 1,30m, where your dog will be able to stay without leash ( dove il vostro cane potrà starci senza l’ausilio del guinzaglio (recommended for large dogs). n° 15 Sea View places equipped with square beach umbrella, 2 beach beds with canopy, safe and dog cot. n° 2 Suite Dog places equipped with gazebo measuring 2,00m x 2,00m with curtains on three sides, 2 beach beds and dog cot. Bathing establishment built according to law against architectural barriers, with toilets, changing rooms for the disabled and walkways of a minimum size of 1,50 meters offering easy access to the sea. Kiosk snack bar where you can stop by with your dog to enjoy a drink or one of our dishes in a unique sea view. Baby point toilette for children, where you can change diaper. Self-service grooming space, designed to facilitate the cleaning of your beloved dog, that after a whole day at the beach, can return to the hotel room, apartment or home with the maximum hygiene. Veterinary Service for all diseases that may arise during the stay on the beach. Presence of a canine highly qualified instructor with a rich entertainment program in order to stimulate and delight your stay and that of your pets inside the Doggy Beach. So much love from all the staff of the Doggy Beach for your puppies! Free showers and hot showers (tockens to be requested in the cashier). Free showers specially designed for dogs. Shower/Nebulizers for dogs with the aim to refresh your 4-legged friend during the hottest hours. SPA Jacuzzi hot tub for the relaxation of people. Play area dedicated to children. Waters delimited in order to guarantee the access to the sea of dogs in complete safety. Corner shop dedicated to dogs, where you will find what you need to spend the day at the beach with your 4-legged friend, just like leashes, bowls, toys and our signed Doggy Beach merchandising.